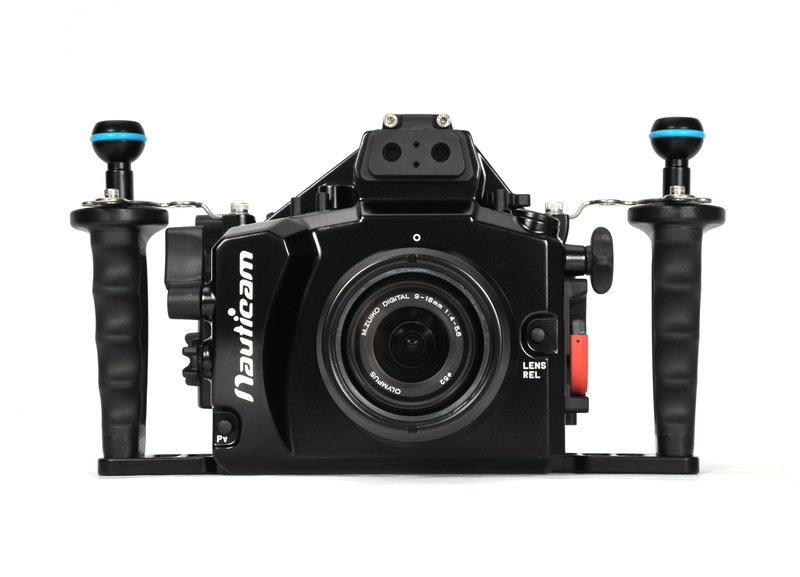 Nauticam announces the release of the NA-EM1, the latest in its acclaimed line of precision crafted underwater camera housings. 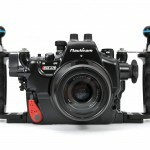 Nauticam has trail-blazed the path in mirrorless housings and is pleased to announce an exceptional housing for the best mirrorless camera to date, the Olympus OM-D E-M1. 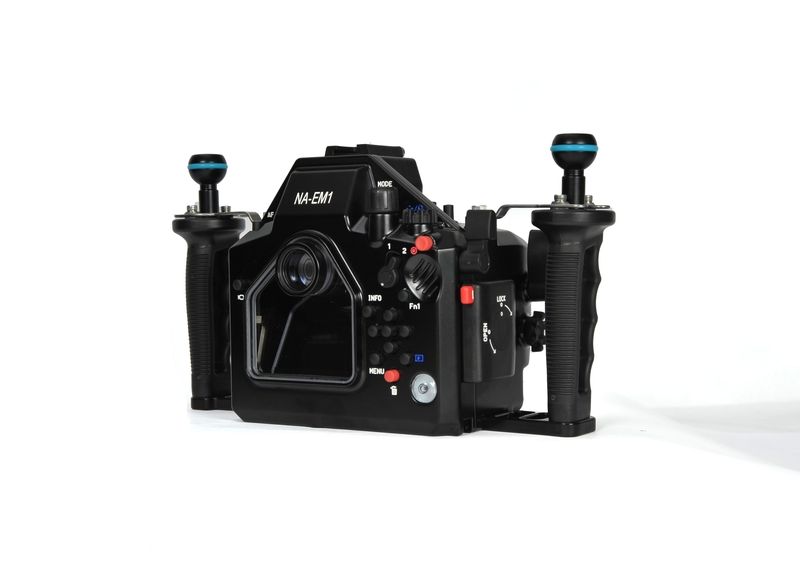 While this housing incorporates some of the best features of the Nauticam housing for the E-M5, the NA-EM1 is a new design, pushing the boundary further towards the ideal human-machine interface. SKU: NA17806. 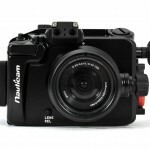 Category: Nauticam Mirrorless Camera Housings. One of the hallmarks of Nauticam housings has always been the secure Locking Port Release system, unique in that it utilizes an internal bayonet system. Nauticam’s SLR housings have always featured a red locking lever that has become the symbol of Nauticam innovation. This iconic control has now come to the mirrorless world, making port changes faster, easy and just as secure. No wrestling, no twisting, no misalignment – just seat and lock. 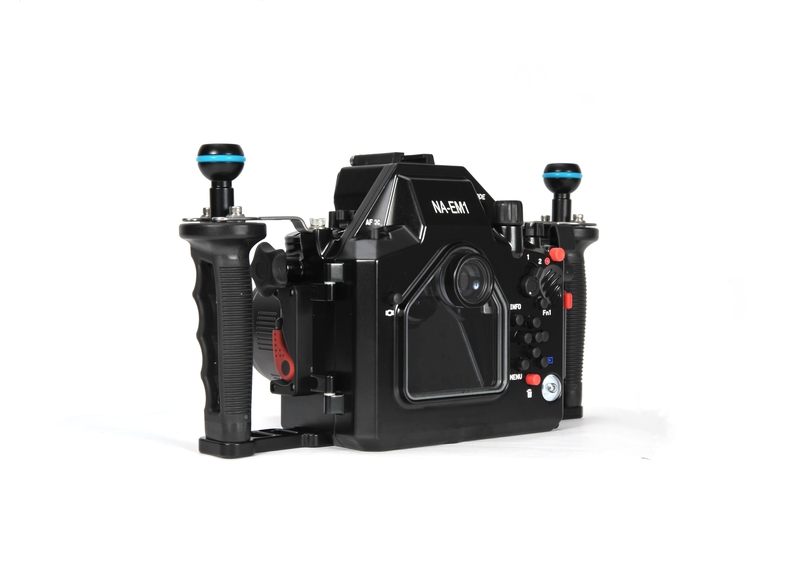 Integrated Electronic Vacuum Check and Leak Detection System The NA-EM1 ships with Nauticam’s new vacuum system with integrated electronic vacuum and leak detection monitoring system for extra piece of mind. A simple coded LED lighting system lets the user know that the watertight integrity is solid. 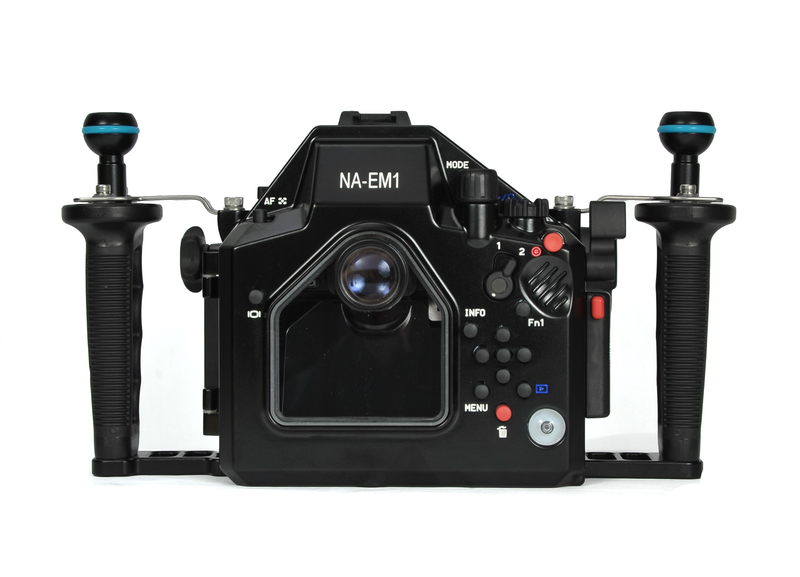 The NA-EM1 ships with a bulkhead port for installing the optional vacuum valves. 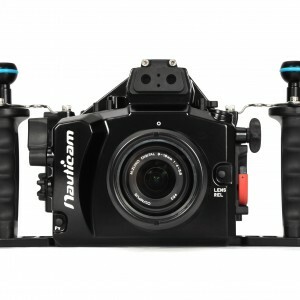 Nauticam Build Quality Of course, the sort of quality and robustness that has become synonymous with the Nauticam name is present with this housing as well. Milled from solid aluminum, the housing is depth rated at 100m and built to last. Exceptional care is taken to reduce any possibility of galvanic corrosion, and the housing is hard anodized to stay looking great after years of use. 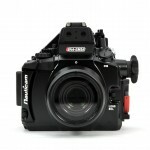 The Nauticam brand is known for superior ergonomics in all their underwater camera housings. The NA-EM1 will only enhance that reputation. Every control is well thought out. Every button, lever and switch is considered not in terms of what is easier for the designer, but what is best for the shooter. The key shooting controls are all easily accessed with the right hand with very little finger movement required. 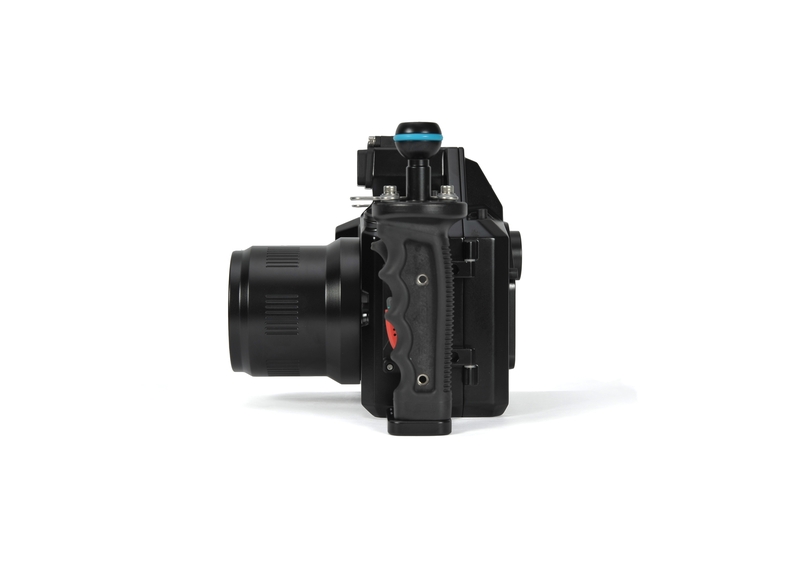 What’s more, since virtually all of the controls on this camera are programmable, the shooter can customize exactly how the rig will respond to the touch. Shoot, change aperture, shoot, change shutter speed, flip to video, change shutter speed, start recording, change ISO – all easily accessible, and all without long reaches that can cause blurry images, mis-framing and shaky video. 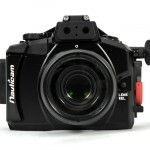 Nauticam produces a “straight” 180º enlarging viewfinder and a 45º angled enlarging viewfinder to enhance the ease of close quarters work often associated with macro shooting. Both viewfinders have high quality optics allow viewing of the entire image. A patented external dioptric adjustment allows personal adjustment to a sharp-as-a-tack standard underwater and viewfinder changes can be executed in less than 30 seconds without using tools. Exceptional composition and focus accuracy have never been more accessible. 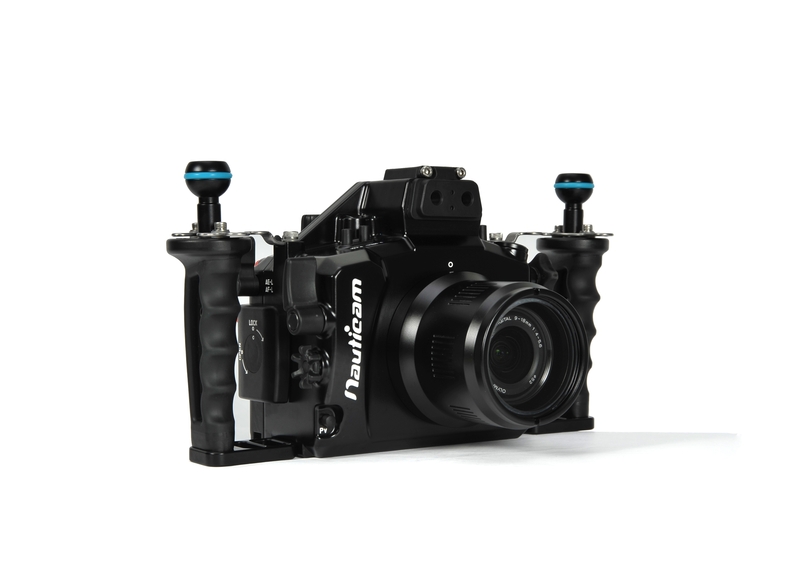 Signature Nauticam Port Locking Lever is included in a mirrorless housing for the first time. Note the lens release button as well… lens/port changes made quick, easy and secure. 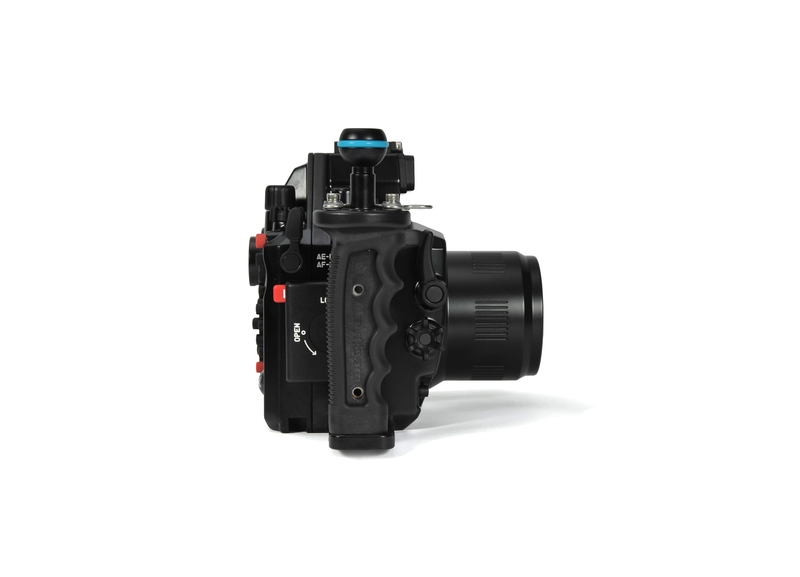 Handles Built In: The housing is designed to be used with the shooter’s hands on the handles, ergonomically placing the camera controls at just the right spot for easy use. No extra tray/handles to buy! Fiber optic bulkheads – eliable automatic flash exposure is available with a variety of optically fired flashes including Inon Z-240 and S-2000, and Sea & Sea YS-D1 and YS-01. This system yields accurate TTL flash performance with no electrical sync cables to flood! View Options: Both the excellent electronic viewfinder and the large LCD of the E-M1 are easily viewed on the back of the housing. For even better viewing, Nauticam provides an option to add the renowned 180º Enhanced Viewfinder or the excellent 45º Enhanced Viewfinder. Note the labeled controls, making it easy to get to know this housing/camera system. Fingertip Control: Fingertip control for all key shooting controls, including both shutter release, focus lock, both command dial, and video start/stop. All of the controls are easy to operate, even with gloves on. Rubberized Zoom/Focus Knob: The new zoom/focus knob is now rubberized to make gripping easier and more comfortable. Nauticam is the only housing manufacturer offering over-molded, rubberized parts. Like previous Nauticam handles, the built-in NA-EM1 handles get the rubberized treatment that so many shooters have come to enjoy. The Most Lenses: The NA-EM1 supports all of the major m4/3 lenses from Olympus and Panasonic that are relevant for underwater. Lenses from previous Olympus four-thirds DSLR cameras are also now supported with the optional extension ring. The gearing in the focus/zoom knob mates with the original gears from Olympus.